Crossing into the San Pedro Parks Wilderness (the name on the sign is incomplete). If I ever do more overnight hikes, my first one will be in the San Pedro Parks Wilderness. This day hike provides a taste of that wilderness area's high forests, mountain meadows, and live streams. The route follows Clear Creek towards its headwaters. The uphill grade is a gentle one and the trail is mostly rock-free, so the hike is suitable for small children. In Cuba, N.M., zero your trip meter at the intersection of U.S. 550 and NM 126, and head east on State Road 126, well into the mountains. After about 9.9 miles, at 35 deg. 59.932 min. N, 106 deg. 50.403 min. W, turn left (north) on FR 70. About trip mile 12.6, right after the road curves sharply to the right, turn into a parking area at 36 deg. 1.666 min. N, 106 deg. 50.808 min. W.
Begin the hike by crossing FR 70 and taking the trail that begins there (at 9255 feet) and wanders northward through the trees. Soon you'll enter the wilderness area. A short while later you'll cross the Cuba Ditch. At 36 deg. 2.339 min. N, 106 deg. 50.784 min. W, the trail comes out of the woods and passes east of San Gregorio Reservoir. To learn a bit of history about the ditch and reservoir, scroll to the bottom of the page. Camping and open fires are prohibited at or near the reservoir but with all the beautiful camping spots farther up the trail, that's not a problem. San Gregorio Reservoir, seen from the trail. With the summer's irrigation water drawn off, the reservoir is at a minimum. One past San Gregorio Reservoir, the trail trends northeast. At 36 deg. 2.855 min. N, 106 deg. 50.380 min. W, you will reach a signpost at the edge of the Vallecito Damian. The Damian Trail goes right. Turn left to stay on the trail up Clear Creek. Beyond the fork, the path bends northwest and heads up Clear Creek Canyon. At 36 deg. 3.634 min. N, 106 deg. 50.918 min. W, the valley splits and so does the trail. The left fork continues up Clear Creek. This part of the upper Clear Creek Trail is fairly new so isn’t shown on many maps, but if your goal is to follow Clear Creek to the San Pedro Parks, do take the left fork as indicated by the sign at the fork. Or if your goal is to hike to the Rio de las Vacas, take the right fork. This sign marks the split between the upper Clear Creek Trail and the Vacas Trail. If your map shows something different, it's out of date. 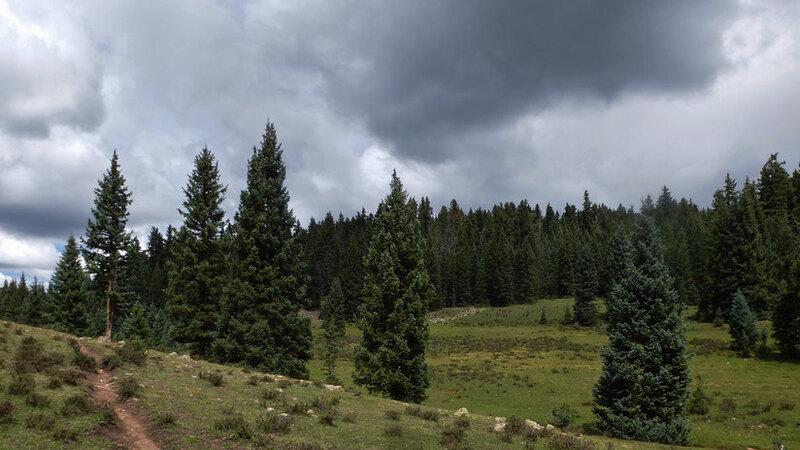 Along either route, soon you'll be in meadows and above 10,000 feet. If you’re looking for a fairly short day hike, about 6 miles, have lunch somewhere in this area and head back down the trail. What the upper Clear Creek drainage looks like, at about 10,000 feet. If you do opt for a short hike, here’s a way to add a tiny loop to the end of the route. In the old days the trail along upper Clear Creek branched off the trail to the Rio de las Vacas farther up than it does today. From about 36 deg. 3.873 min. N, 106 deg. 50.735 min. W on the Vacas Trail, the trail to and along upper Clear Creek went west, over a low, densely wooded rise, and dropped down to Clear Creek before turning north. Today, only the cows remember this segment of the trail, but it’s mostly still there. If you head to 36 deg. 3.871 min. N, 106 deg. 50.789 min. W, you’ll pick up the cow path. Follow it into and through the woods. About 200 meters later you’ll emerge at the top of a meadow that slopes down to Clear Creek, which you can practically step across to join the upper Clear Creek Trail. Follow that trail down to the current junction, closing the loop. If you're looking for a long day hike, however, continue to the the "parks" (meadows) that gave the wilderness area its name. The trail along upper Clear Creek will take you directly there. Or head northeast to the Rio de las Vacas (36 deg. 4.872 min. N, 106 deg. 49.501 min. W), then (if time permits) up the Rito Anastacio. You could even make a large loop, going up one way and coming down the other, as part of an overnight trip. The Nacimiento Community Ditch Association maintains irrigation rights established in 1882. The first generation of local irrigation farmers began diverting water from the Clear Creek watershed between 1885 and 1890; their inter-basin diversion rights were confirmed in 1927. The Cuba Ditch diverts water from the Rio de Las Vacas to Clear Creek. Shortly downstream from that point, the combined waters are diverted from Clear Creek, eventually reaching fields near Cuba. In 1958, San Gregorio Dam was built to hold water for the Ditch Association and to create a fishing lake for the New Mexico Department of Game and Fish. The dam is upstream from the diversion point for the Nacimiento Community Ditch, so water released from the reservoir can be diverted for farming. The dam is designed so that when all of the irrigation water stored behind it is released, some water remains for the fish. The following map is cleaned up from one I found in a government report, and shows the inter-basin diversion system as of 1983.